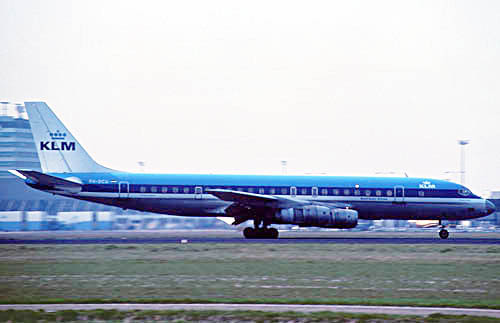 This DC-8-55F PH-DCU (c/n 45859/253) must have been one of my earliest slides of a civil jetliner; it was taken one day in May 1980 at Amsterdam IAP. After being sold, it carried N29954 as a tailnumber and was written off on 31Mar88 in Cairo,Egypt. This was when it was operating as 5N-ARH for Arax Airlines. It was the only aircraft Arax operated and was based in Lagos, Nigeria. McDonnell-Douglas DC-8-63 PH-DEH (c/n 46075/484) is seen here operating for Surinam Airways, though nothing more than a sticker on the forward fuselage has been done about it. 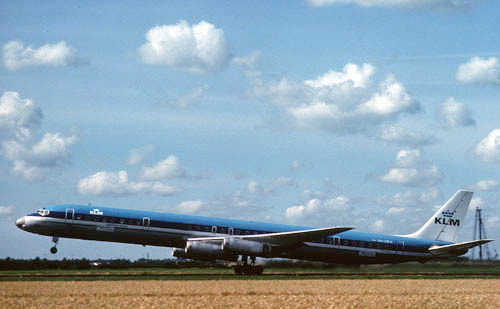 It had been delivered to KLM in 1969. I don't have a specific date for this photo, but it was probably during the 1980s. This DC-8 took on the following identities: TF-FLT, N512FP and is anno 2002 operating for Airborne Express as N818AX. If I remember correctly, the blue colour on the topdeck was a shade lighter than what was carried during the 1990s, though sunshine and weather had a discoloring effect on this darker blue. 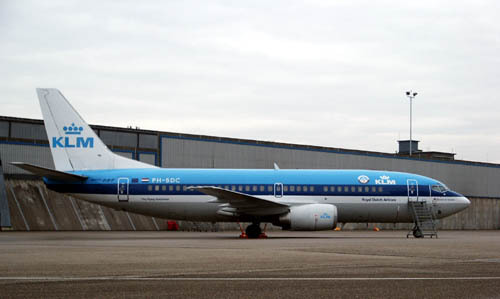 KLM's Boeing 737-306 PH-BDC (c/n 23539/1295) is seen here parked in the maintenance area (" Schiphol-East") on 10Jan03. 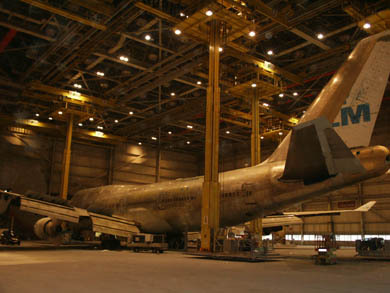 On Feb.10th 2003 KLM's PH-BFK (747-406(M), c/n 25087/854) was in hangar 14 and in the last stages of being stripped of its old colourscheme. 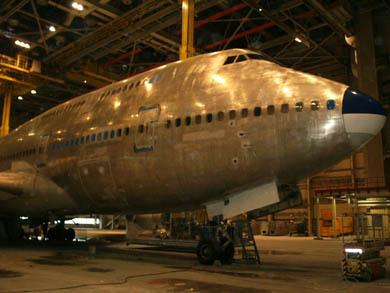 Next would be a few weeks of "heavy maintenance" and then back to hangar 14 for a new coat of paint. 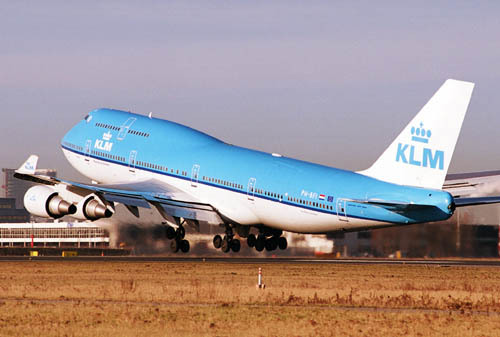 The first aircraft in the new livery: PH-BFI 747-406(M) (c/n 25086/850) is seen taking off from runway 24 at Amsterdam IAP during January 2003. 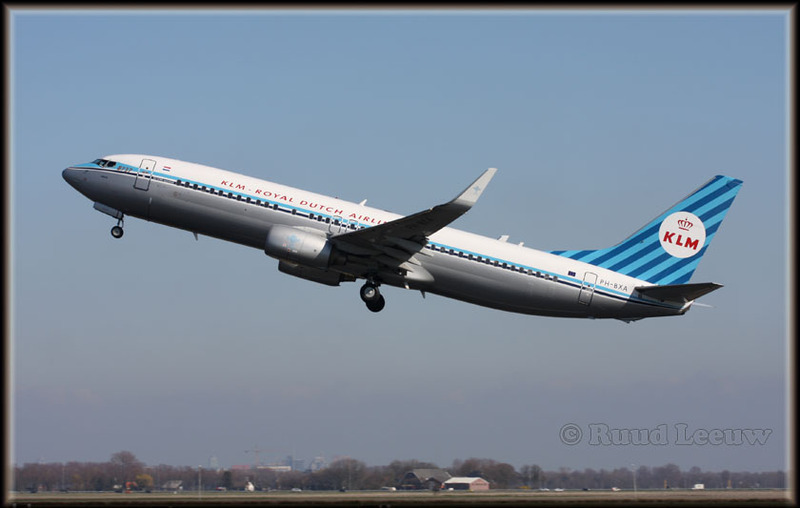 In January 2009 KLM introduced a 'retro'-livery on 737-8K2 PH-BXA (c/n 29131/198): very nice! Photo taken at Amsterdam IAP on 01Apr09.